WASHINGTON, D.C. -- About six in 10 Americans are confident that votes will be accurately cast and counted in the coming election. This is similar to their confidence level in 2008, but down from levels from 2004 to 2007 when confidence ranged between 71% and 75%. 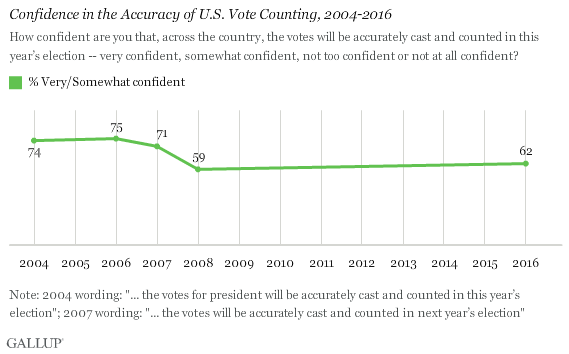 Despite the controversy over ballot accuracy in the 2000 election, Gallup's trend shows that the highest level of voting confidence was in 2004 -- the first time Gallup polled on this question -- four months before that year's presidential election. 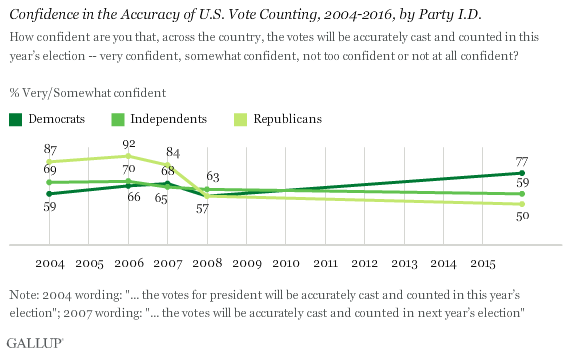 Confidence remained similarly high in the 2006 midterm and in December 2007, shortly before the 2008 presidential primaries and caucuses started. Before the 2008 election, confidence in the accuracy of vote counting had dropped sharply, perhaps as an indirectly related response to the global financial crisis that sent Americans' satisfaction with the way things were going in the U.S. into the single digits. Eight years later, the confidence level in voting accuracy is not much higher. Prominent political figures and former federal security officials raised concerns about a compromised vote count leading up to Gallup's latest measurement, taken in an Aug. 15-16 poll. In April, supporters of Democratic primary candidate Bernie Sanders raised questions after more than 100,000 voters were purged from the New York City Board of Elections. More recently, Republican presidential nominee Donald Trump suggested that the election is going to be rigged, saying courts that have thrown out state voter ID laws have left voting systems vulnerable to fraud. Though these examples of doubts about the election's accuracy could be politically motivated, there are real threats. Due to the patchwork of state voting systems, some of which have electronic vulnerabilities, many security officials warn of the prospect of foreign hacking, especially in the wake of Russia's suspected involvement in the successful infiltration of the Democratic National Committee's email system. Just after Gallup's August poll, the FBI alerted that one state's Board of Election site was compromised and that another state's election system had an attempted intrusion. Perhaps related to their party nominee's view, only half of Republicans say they are "very confident" or "somewhat confident" that votes will be accurately cast and counted in this year's election. This is the lowest Gallup has recorded for the GOP in five measures, and much lower than current confidence among independents (59%) and Democrats (77%). Americans have expressed more confidence when a president of their same party occupies the White House, helping to explain why Republicans were much more confident in the vote count during George W. Bush's presidency and why Democrats are much more confident under President Barack Obama. However, both parties expressed equally slim confidence in the accuracy of vote counting in 2008, at 57%. While many Americans have doubts about the integrity of the vote count in the nation at large, they are much more likely to express confidence in the facilities where they vote. About four in five Americans (81%) say they are very or somewhat confident in the accuracy of vote casting and counting at their local polling station, though this is down from 91% in 2006 and 88% in 2007. How confident are you that, at the voting facility where you vote, the votes will be accurately cast and counted in this year's election -- very confident, somewhat confident, not too confident or not at all confident? * 2007 wording: "... in next year's election"
The current measures are consistent with Americans' tendency to rate local conditions and their own personal situation better than the situation in the country as a whole, including on crime, healthcare and economic matters. Though a majority of Americans still say they have faith in the accuracy of U.S. elections, the level of confidence isn't what it once was. And with legitimate threats to state voting systems, Americans have reason to have some doubt about their accuracy, while some may subscribe to a more politically motivated idea of it being rigged. There is a political element to views of the integrity of the vote count, however. Americans have been more likely to feel confident when a member of their party occupies the White House. And these political bents are reflected in Republicans' and Democrats' respective level of support for voter ID laws and early voting. A strong majority of U.S. adults have faith in their local polling facility's accuracy, suggesting that they are less concerned about their own vote not being cast and counted properly as they are about fraud elsewhere in the country. Their lower confidence about voting accuracy nationally could have ramifications for a new president whose constituents have doubts about the legitimacy of the win. Results for this Gallup poll are based on telephone interviews conducted Aug. 15-16, 2016, on the Gallup U.S. Daily survey, with a random sample of 1,013 adults, aged 18 and older, living in all 50 U.S. states and the District of Columbia. Each question was asked of a randomly selected half-sample of approximately 500 adults. For results based on each half-sample of national adults, the margin of sampling error is ±6 percentage points at the 95% confidence level. All reported margins of sampling error include computed design effects for weighting. In March 1965, Gallup found extensive public support for President Lyndon Johnson's proposal to have the federal government oversee voting in areas where blacks had been denied the right to vote.